At North Suburban Medical Center a group of women meets each week to crochet and knit blankets for the hospital's newborns. THORNTON, Colo. — At North Suburban Medical Center, a group of women meets each week to crochet and knit blankets for the hospital's newborns. This is no group of granny knitters. It's more like a girl gang — fun, feisty and full of life. At the center of that spark is 89-year-old Irene Coleman. "She's always happy," said fellow knitter Velva McGee. 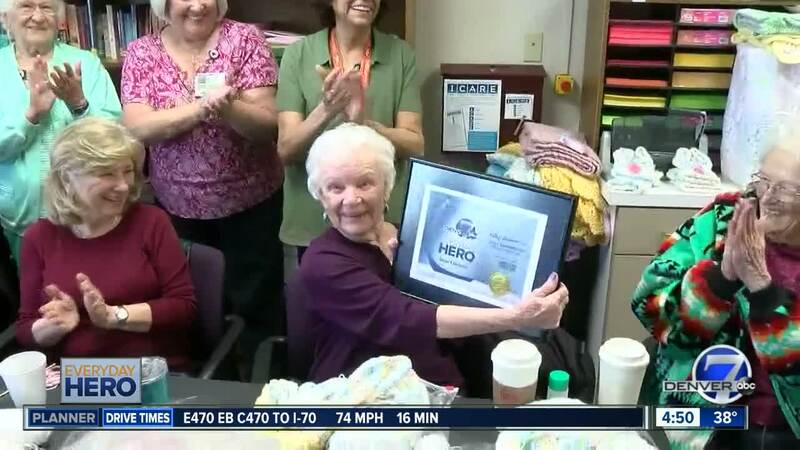 Coleman has been volunteering at the hospital for the past 22 years. "I thoroughly enjoy it," she said. "We’ve got a great group of ladies. Talented and really nice." The group meets each Tuesday for hours, knitting and crocheting blankets and booties for the hospital's newborns. "She gives herself selflessly because they literally spend their own money when they’re making items — blankets, hats. You name it, they make it," said North Suburban Medical Center Volunteer Manager Lori Ward. Coleman has dedicated more than 14,000 hours of volunteer time. "It keeps my hands moving, and my brain — it’s good for that," Coleman said. Not to mention, it's good for the soul. "We can all relate to each other in that respect too," McGee said. "Losing a husband or losing a child, whatever and kind of boost the other one." The women have seen each other through many of the ups and downs of life. "At the end of this month, I’m expecting my 22nd great-grandbaby," Coleman said, smiling. Although Coleman is one of the longest-serving volunteers at the hospital, she has no intention of putting her knitting needles away anytime soon. "I think we all get the satisfaction of doing something for somebody. So I think that’s what we enjoy the most," Coleman said. If you would like to help, the North Suburban Volunteer department does accept donations of new fabric, pillow fill and yarn to help the crafting group make the items. Call 303-450-4597 for more information.